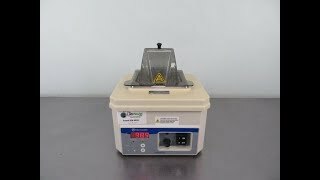 The Fisher Scientific Isotemp 2329 Water Bath is great for biomedical, pharmaceutical, industrial, and clinical functions. This 2.5 liter Water bath by Fisher is easy to read from anywhere around the lab on its brightly lit digital display that shows either °C or °F. The temperature range of this lab bath is ambient to 99°C with a ±0.24°C uniformity, ±0.5°C accuracy and stability at 37°C. This water bath has a low profile front panel controls for an easier approach. The Fisher Scientific water bath 2329 comes equipped with dual thermostats guard against thermal runaway. The digital 2.5 liter water bath’s cover stays open at 90° for use with large glassware, quick- release hinge, lift off completely. The Lab Water Bath also has hinged acrylic gable covers to channel condensation away from your samples and fins to protect hands from hot vapors. This Fisher Scientific Isotemp 2329 Waterbath has been thoroughly inspected and is performing to expectations. All of our lab equipment comes backed with our standard warranty. Should you have any questions, please don't hesitate to contact us.